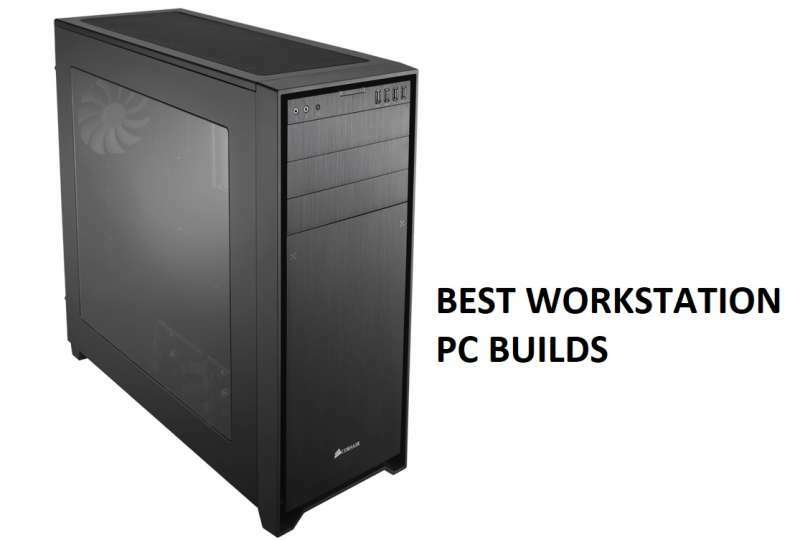 Workstations are among the best builds you should put together yourself. Big box companies often markup their machines by thousands of dollars and get away with it because businesses and professionals are willing to pay for the extra cost. However, if you’re willing to spend a couple hours on a weekend building your own brand new workstation, you can easily save thousands of dollars! Don’t pay Dell, HP, or Apple $5,000 for what you can build yourself for $2,000! Below you’ll find a list of what we think are the best, most recommended purpose built workstation PC computer builds out there sorted by budget. Each piece of hardware in each build is hand-picked by our staff through consideration of a multitude of criteria such as price, performance, reliability, and cost.Furthermore, hardware recommend for our builds all have either been reviewed by us or is well known and highly regarded by the hardware community to ensure that our recommendations will give you the best workstation PC out there for the price. We’ve also designed our builds to be extremely balanced as well, so you’ll find that each build will have plenty of upgrade opportunities down the road. As usual, this article is meant to serve as a guide for reference purposes only. Hardware prices and availability constantly fluctuate, so if any piece of hardware listed below is out of stock, or is priced improperly, be sure to let us know in our community forums. The purpose of our entry level workstation is to build a fairly powerful workhorse for professionals on a budget working in fields such as photography, light videography, light 3D Modeling, etc. Now the idea behind this build is that it’s an all purpose workstation that isn’t necessarily application specific yet has plenty of room for upgrades depending on application or if additional performance is needed down the line. With our entry level workstation, I’d recommend this build as more of a photo editing rather than video editing or 3D modeling system, but it will work for those applications as well. Those looking for a workstation oriented primarily towards video editing or 3D modeling should definitely check out our mid-range or high-end workstations builds instead. Alright, so you’ve got a couple more bucks to spend and you want to build a higher performance workstation. You want something with a bit more power under the hood, but you don’t really want to spend too much either just yet. Welcome to the mid range workstation. This workstation is better suited towards video editing and will handle photo editing perfect as well. This setup is great for those who enjoy creating as a hobby and need something with upgrade potential that will last a couple years or more. So video editing, photo editing, or 3D modeling is practically your job and you need a superfast rig that’ll process/render/encode all of your photos, videos, and 3D models without breaking a sweat. You’ve checked out Dell, you’ve checked out HP. Companies like these want $5,000+ for a PC that would suit your needs, and unfortunately while you’d be happy to blow $2,000, you’re not ready to drop $5,000. Understandable. What can you do? Well, how about buying some hardware and building it all yourself! Those looking an entry level or mid range workstation will find that the graphics card is optional. While you’d expect that it might be necessary to have a graphics card for video or photo editing, these tasks are actually CPU intensive, which means a graphics card won’t necessarily do much especially if you’re using software that isn’t optimized for GPU acceleration. With Intel’s onboard graphics being as powerful as they are these days, those looking to do photo work or some light video work will find that onboard graphics is all you need. That said, those of you who purchase systems that don’t include integrated video or are looking to do some heavy video editing with applications that support workstation graphics such as Adobe Premiere or Sony Vegas along with those of you who work with 3D graphics or 3D modeling applications such as 3DS Max, Maya, POV Ray, etc., you may benefit from purchasing a workstation class graphics card. While these graphics cards are hardware wise identical to lower to mid range gaming graphics cards, what you’re actually paying for are drivers that will accelerate stuff like viewports in your 3D models. While it’s unfortunate that you have to pay 3x-4x more than a gaming graphics card, companies like Nvidia and AMD conveniently leave out 3D modeling optimized code in the drivers so you pretty much have no choice but to purchase these workstation class graphics cards. Similarly, many professional video editing applications will not recognize non-workstation grade graphics cards, which means if you want GPU acceleration on your videos, you’ll have to shell out the extra for a workstation class graphics card. Below then are a couple recommended graphics cards if you’re planning on building a new video editing or 3D graphics workstation. Our recommendations below are exclusively Nvidia as they feature CUDA support, which is a GPU acceleration technology that a lot of 3D modeling and video editing applications support. Up until AMD’s release of their new Zen architecture based CPUs, AMD wasn’t really a consideration for anyone looking to build a powerful workstation system. However, with the launch of the Ryzen and Ryzen Threadripper CPUs in 2017, AMD returned from the ashes to deliver performance that can finally rival their Intel counterparts. Since the initial release of Ryzen, AMD released their 2nd Generation Ryzen CPUs which deliver increased performance yet still manage to retain the same price points of their predecessors. Last year, we began including AMD CPU powered builds alongside their Intel CPU based counterparts and many have asked us for advice on which to pick. While we’d love to provide a simple pick Intel or pick AMD answer, the actual answer is quite a bit more complex. When it comes to processor performance, the biggest advantage Intel has over AMD is Intel’s incredible IPC performance. While AMD has improved by many orders of magnitude from the Bulldozer (pre-Ryzen) architecture based CPUs, AMD Ryzen CPUs still aren’t capable of processing as many IPC (Instructions Per Cycle) as their Intel counterparts. This deficit currently averages somewhere between 10-20% depending on the application. To mitigate this issue, AMD has included more cores within each CPU to process data. As a result, those working with applications that support multi-core processing will find very good value in AMD CPUs as applications that support multi-threading well will benefit greatly from the increased number of cores. Some examples of applications that benefit greatly from multi-core processors include any sort of video editing and heavy multi-tasking. The other major thing to consider when it comes to the Intel vs AMD debate is the potential for platform issues. The reason for this is because unlike Intel which has had years and years of time crushing bugs and perfecting their platform, AMD’s Zen and 2nd Generation Zen architecture based CPUs (Ryzen and Ryzen 2) have only been on the market for just two years. As a result, AMD is still resolving a lot of bugs and issues when it comes to software. While these bugs are being resolved at an extremely fast rate, those who need a workstation that’s solid with little known bugs should opt for an Intel based workstation while those who don’t mind updating their system and potentially living with some bugs until they are resolved can get a lot of performance at a significantly better pricepoint. It’s been over three years since AMD has launched the Ryzen platform and as a result, most if not all of these platform issues are now no longer relevant. The latest BIOS updates have crushed most of the bugs that plagued the first generation Ryzen platform and for most prosumers and workstation users, the AMD and Intel platform should be as widely compatible, stable, and bug-free as the Intel platform. If you have different experiences with specific applications or hardware, please let us know in the comment section or in our community forums. *Updated builds for entry level and mid-range to ensure all components are in stock. High-end builds are still up to date as of the latest update. Question about why we chose X and not Y? Ask us in our community forums! We’d be happy to make recommendations on alternatives for out of stock parts, alternatives on in stock parts, help on putting the entire system together, and even suggest you a 100% custom build fit for your needs if you’d like. All you have to do is visit our forums, register, and post in the appropriate section! If you’d like more immediate help, feel free to swing by our community Discord channel.